This dirt cake recipe is a fun cooking activity to do with the kids. It is easy to make (no baking or heating required), and the kids love the idea of eating dirt (really crushed sandwich cookies, like Oreos or any other chocolate cookie). 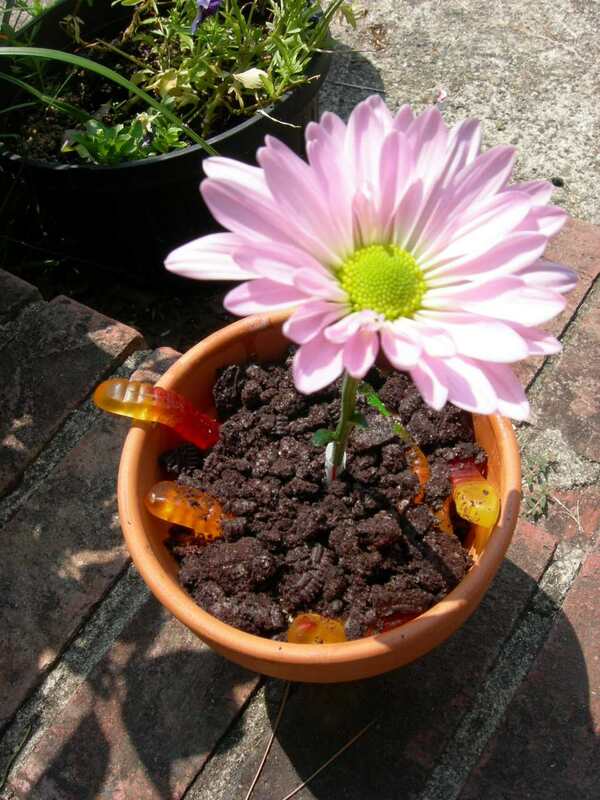 Although you can make this dirt cake in any pan, I like to make it in a clean flower pot. It enhances the whole effect, especially topped with gummy worms. It's a whimsical dessert for birthday parties and unusual enough for Halloween. Place chocolate sandwich cookies in a food processor, fitted with a metal blade. Pulse until the cookies become coarse crumbs. Whisk together the chocolate pudding and milk until thick and pudding-like. Chill while making the cream cheese mixture. Beat the cream cheese with an electric mixer until fluffy. Beat in 1 container of thawed whipped topping until smooth. Add the cream cheese mixture to the chocolate pudding mixture, mixing until smooth. Place a layer of the cookie crumbs in the bottom of the lined flower pot. Top with a layer of the chocolate pudding mixture. Spread the remaining container of thawed whipped topping over the last layer of chocolate pudding. Top with the remaining cookie crumbs and place a few gummy worms on the dirt cake. You could even bury them partially, making it look like they are crawling out of the dirt. Place a clean fake flower stem in the dirt to finish the effect. This dirt cake can be made several hours before serving. Just cover with plastic wrap and refrigerate until ready to serve. When ready, be sure to scoop into the layers so that everyone gets a little bit of everything.